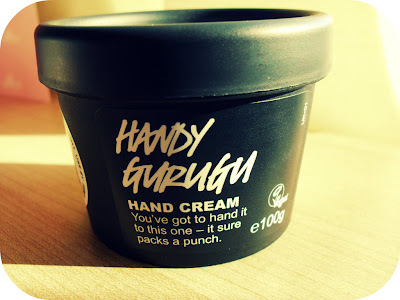 I recently purchased Lush's Handy Gurugu hand cream, as this weather was doing nothing for my hands, going from the freezing cold into heated university buildings was causing havoc to my skin particularly on my knuckles (is it ever going to stop raining? That's what I want to know!). I'd seen a few reviews on Handy Gurugu which said it was great for dry skin so I thought i'd give it a go. It's not much to look at let's be honest but are any hand creams? It does have a slight greenish tinge but that doesn't bother me, although it might some. The smell is hard to pin down, it reminds me of the Lush stores themselves, it definitely has that signature scent, but its light and smells fresh. The most prominant smell is rose water, at least that's what I can pick out. It is described as a very butter rich cream and they aren't joking its got shea butter, organic peanut butter, organic almond butter, organic cashew butter and organic pumpkinseed butter in it! Along with other essential oils. As it says on the tub a little goes a long, you definitely don't need much of this. It does feel quite sticky when you first rub it in, which did put me off slightly when I first used it, however do persevere because it does soak in and it leaves your skin feeling very soft and nourished and it has done my hands a world of good, the skin feels less tight and feels much softer. The key is definitely not to use too much, its definitely made with very very dry skin in mind and I feel its definitely more of a winter product and would be great if you suffer from cracked knuckles in cold weather. It retails for £7.25 for 100g, which yes is quite pricey. Lush is not the cheapest on the market there's no getting away from that, but it will last a long time and the shea butter in this product comes from a women's co-operative, The Ojoba Project in Ghana so I don't begrudge paying the money for it. If you are looking for something a little less intense then i'd recommend Soap and Glory's Hand Food, I carry a little tube of it in my bag at all times. 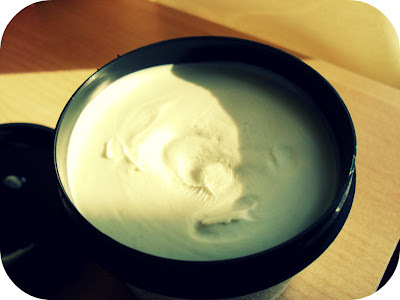 It smells amazing and is non-greasy, it soaks in so fast and leaves your hands feeling incredibly soft. The mini 50ml tube is £2.50 and is in my opinion the perfect size to just carry around with you, at work, school, uni anywhere. So that's my little review, i'd say go for Handy Gurugu if you suffer with extremely dry, cracked skin and need something to sort it out and fast because it is incredibly good for that, but if you don't have such an issue then Hand Food is a good everyday hand cream that's not too heavy. I was given a tiny sample of Lush's Lemony Flutter Cuticle Butter (oh wow, i've just realised that rhymes!) and it lasted for absolutely aaaages. I think Lush products are more expensive as a lump sum, but work out cheaper as they just last for so long! Found your blog through Blog Cat and came to say hi! 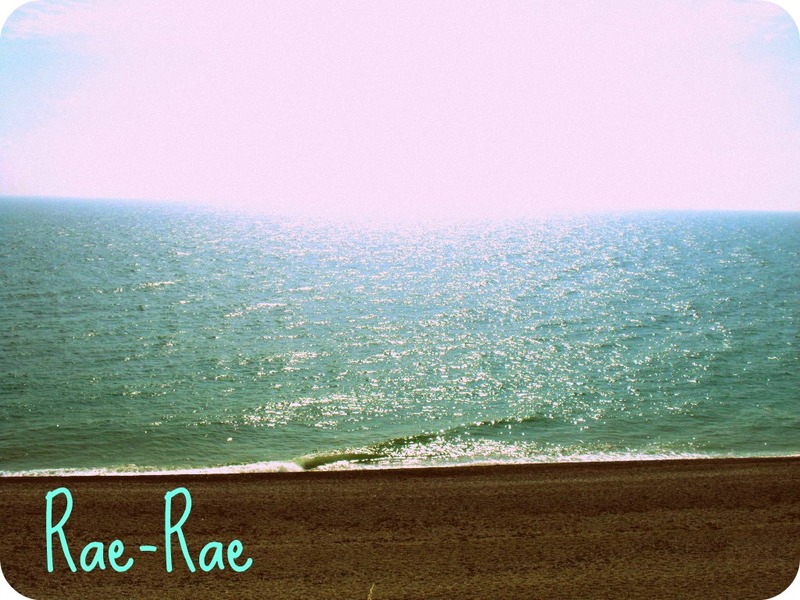 Really like it, following you now! I'm a big fan of Lush for face masks and bath bombs, but haven't tried much else. This looks fab though!